In the Tables forum I said that I wanted to post a series of some of the structures that I've built/am building for your review and edification. The new layout is big enough for a lot of stuff. 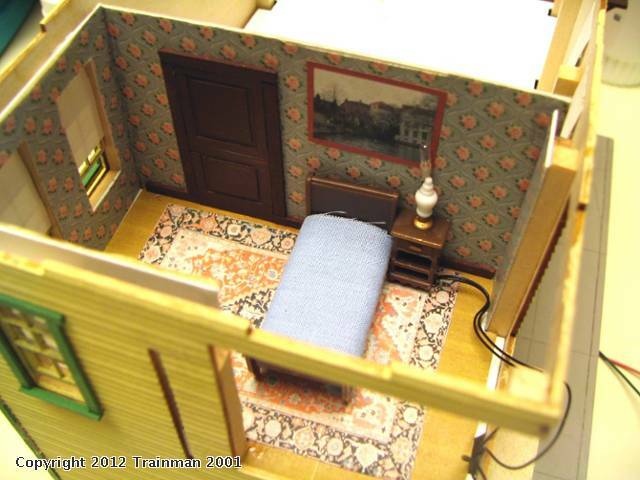 These buildings were started before I had a layout in anticipation of one. I have several more waiting for constuction and there are many, many that I'd like to buy. The first one that I built was in 1997. I was working on an SAP installation project at Henkel's plant in Cincinnati. I was staying at an appartment and flying home on the weekends, so after the first week, I drove from Bucks County with my car loaded with modeling supplies (inc. my airbrush and compressor) so I wouldn't go crazy out there. 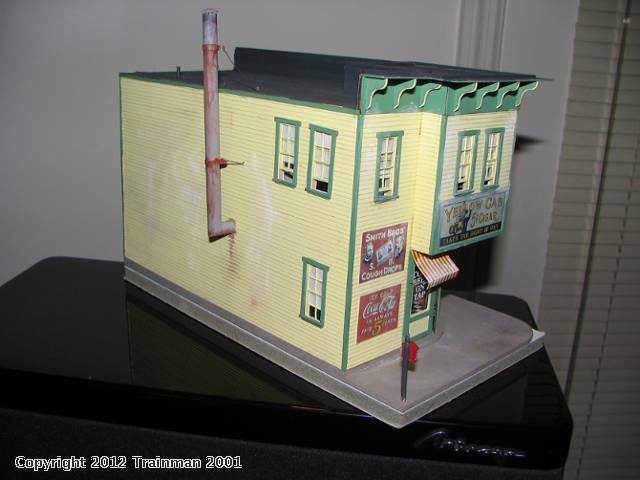 I bought the Gloor Craft timber framed coaling station. It took the seven weeks that the project lasted to finish it and I then brought the Jimmy out to Cincy again to bring it all home. It's right now sitting in the basement wrapped in styrene bead board waiting for the layout to be ready for an engine facility (a couple of years from now). 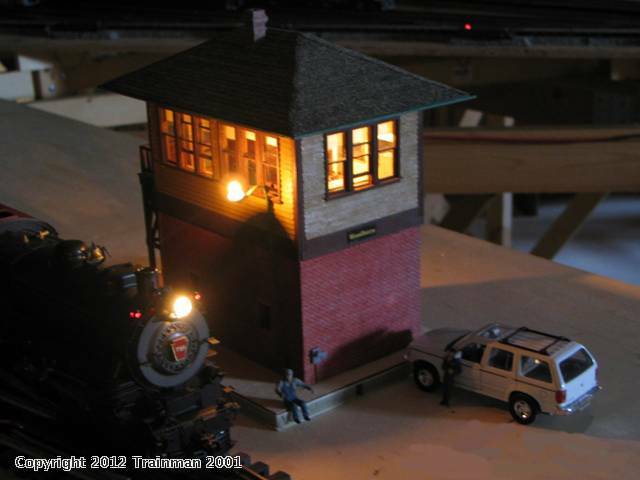 The next project was a Model Tech Miniatures Signal Tower with I added a full interior. I made calendars and pictures fro the walls using images that I had and reducing them to 1:48 in Corel Draw. I use this program a lot in doing structure and layout assembly drawings. My layouts are designed in RRTrack, now version 5.0. Following this I continued building for the service area with a Model Tech Studios Sanding Tower. This was a fun little kit. 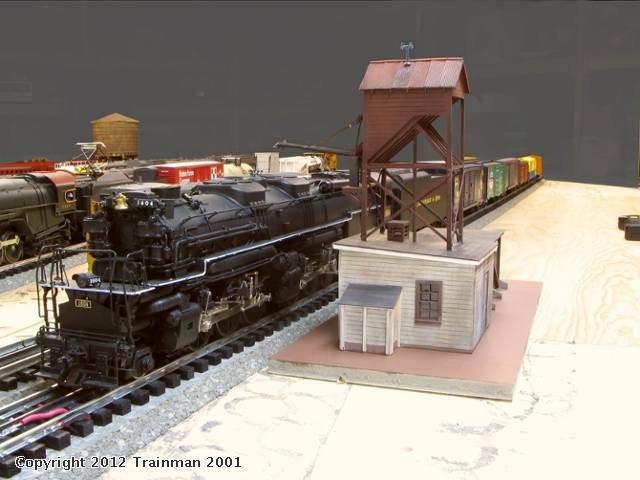 Sitting next to the sanding tower is my 3rd Rail Allegheny. 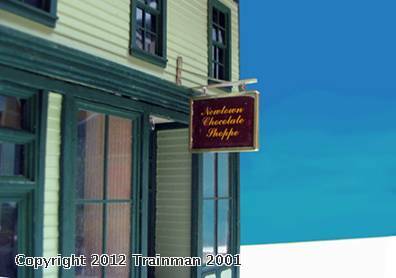 This was shot on my Newtown, PA version of the layout. 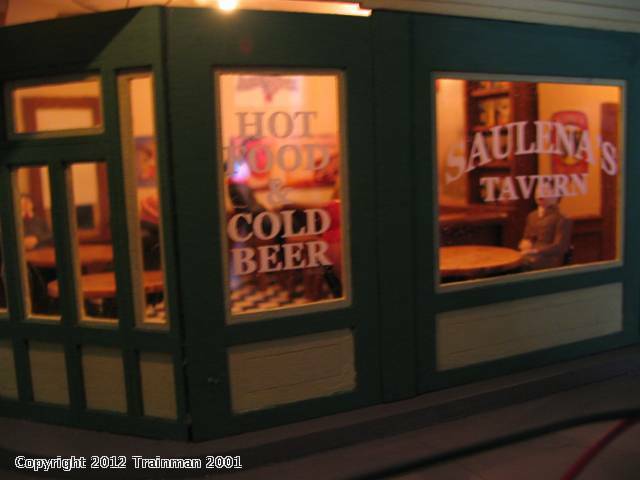 What follows is my first Bar Mills kit; Saulena's Tavern. 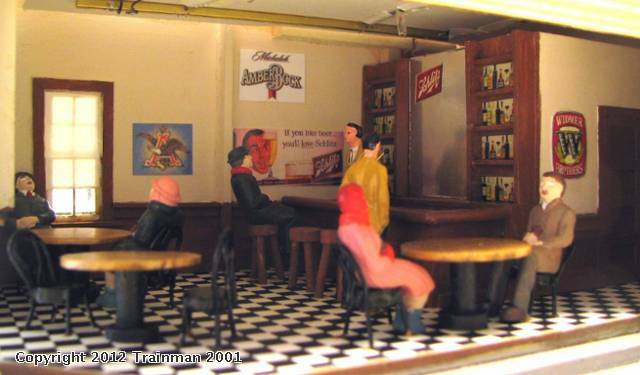 Again I went a bit nuts building an entire bar interior and then a bedroom on the second floor. While you can see the bar through the big windows, seeing the inside of the bedroom is next to impossible. 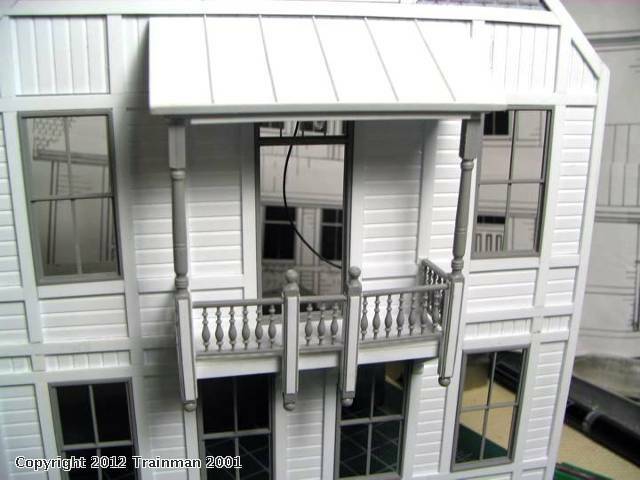 It's going to have be sited near the front of the layout so folks can look inside. The smoke jack going up the backside was scratch built. The bar taps were made of brass and I used photos of liquor bottles that I grouped and photographed and then reduced them to 1:48. 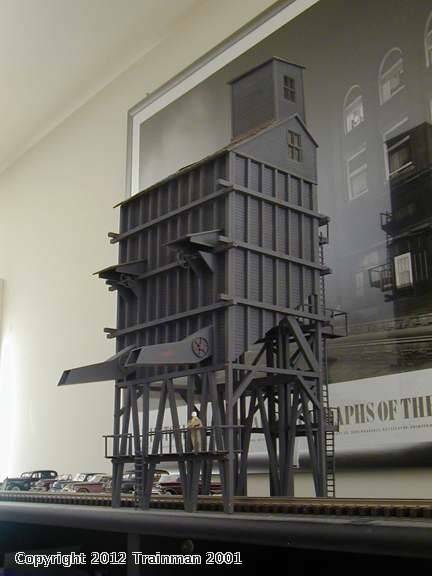 Bar Mills selected this as their "model of the month" when I built it. Here's a great example of AMS (Advanced Modeler's Syndrome). I wanted to have bent wood chairs for the bar. So I had to fabricate them in 1:48. I researched them on the Web, and then soldered them up. 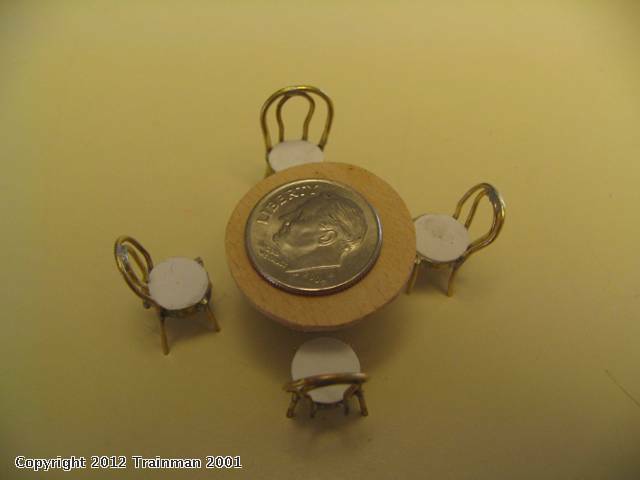 Here's one table's worth with a dime as a size reference. In the bar, they're painted black. I really like Bar Mills' kits so I bought another and built it, "the Idaho Hotel." It was complex with tons of windows. 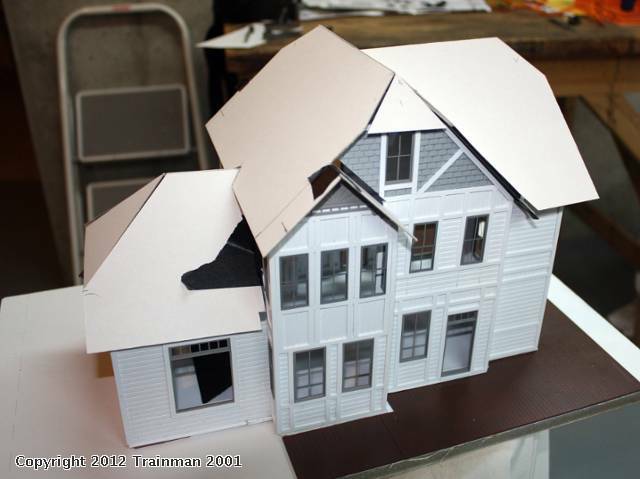 I used an Evergreen "standing seam roof" for this model. That was a bit tedious to do, but looks great. This one does not have an interior, but has some lights. 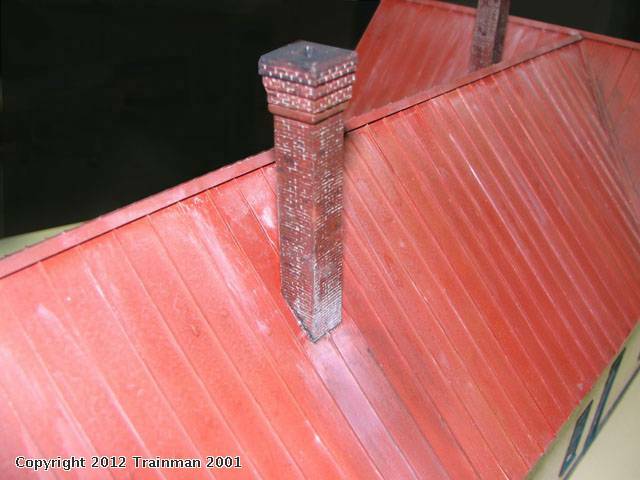 At this point I felt confident enough to dig into another kit that I bought at Golf Manor Hobbies in Cincy where I bought the Gloor Craft Coaling Station. 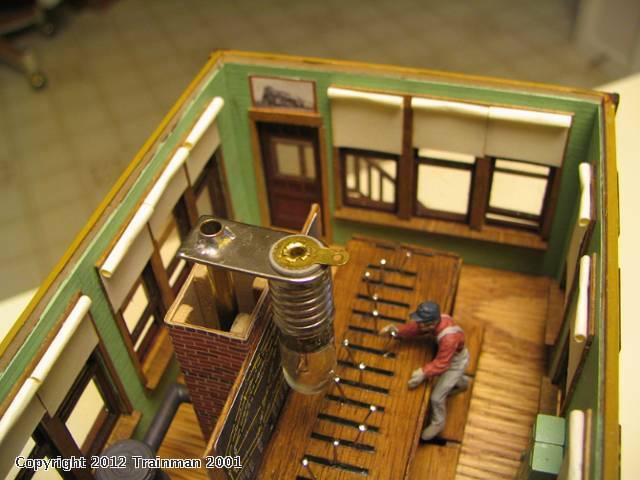 It's a Steam Era Structures kit and frankly, is one of the most difficult in today's market. Rather than laser-cut, tab construction, it was a project that required lots of layout and cutting. It used a double wall construction with bass wood siding backed up with heavy card stock that you must cut. It was "Tudlow's Confectionery" which I renamed "the Newtown Chocoletieria" representing our favorite chocolate shop where we used to live. I built a full interior for the showroom and it took many months to complete. The last project I started before the move was my most challenging. I bought the Kalmback "Structures you can Build" book. 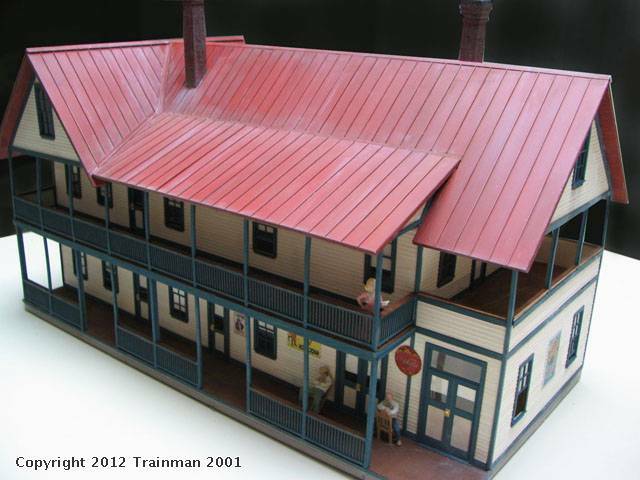 In it was a reprint of an article describing a scratch build of a Victorian Station on the NYO&W RR. 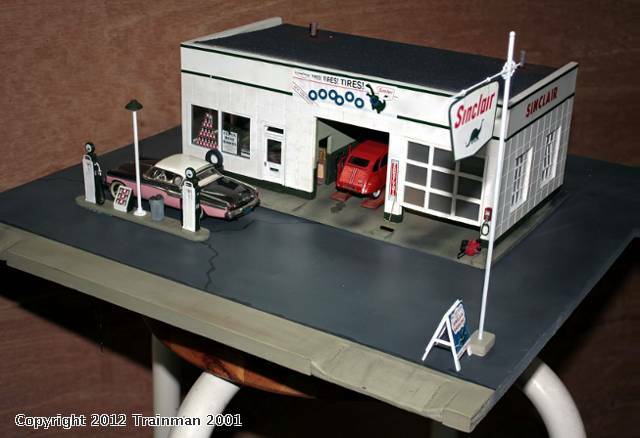 It was done entirely in styrene. And it was in HO (what else?) I scanned the drawings and imported them into CorelDraw. I set the scale at 1:48 and elarged the drawing on the screen so the stated dimensions exactly matched the 1:48 guidelines on the screen. Once the size was correct, I put the drawing on it's own layer and then made that layer uneditable. I then drew my own working drawing right on top of this image. When we moved, I had the walls complete, but didn't have a roof. After the move I built the roof pieces, but then I had to stop because I undertook a very complex project; a 1:16 scale B-17, 4 engine, RC plane. I met a guy at the hobby shop, and after having a conversation about model building he asked if I would build this plane on a commission. I always wanted to build a multi-engine RC plane and here was my chance to do it on someone else's nickel. I'm trying add another picture here, but the loader keeps jumping me out of the upload frame. 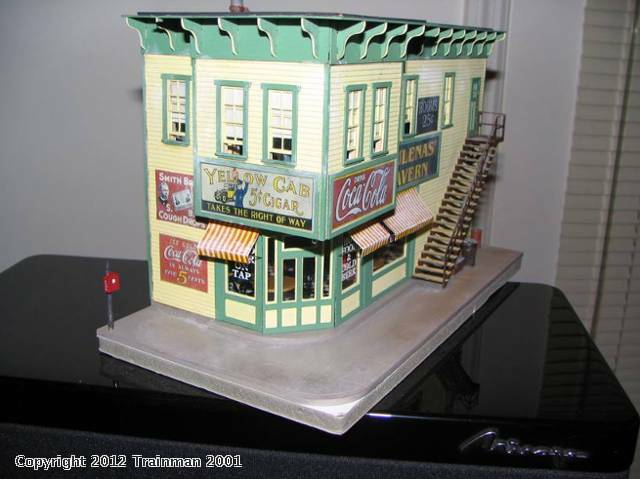 I've also built a couple of old Craftsman style car kits from Quality Craft and Ambroid. These were given to me by a colleague who no longer desired to build them. 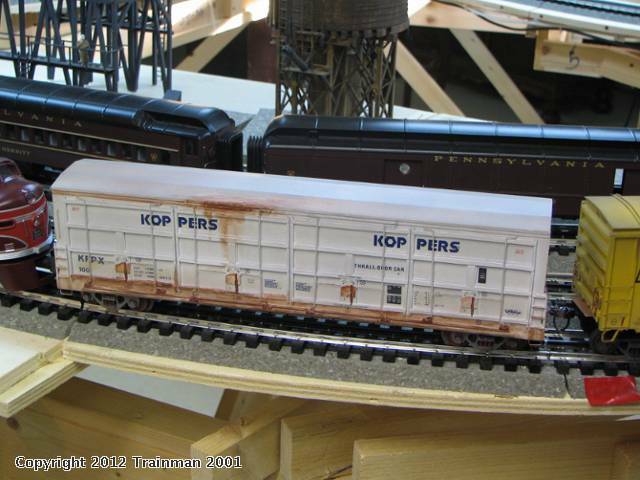 The first is a RailBox car. Being my own construction I did some mild weathering. I also built a Thrall All-door car. Both came out okay, but the rust I put on the all door is a bit on the heavy side. Someday I take a shot at toning it down. I now use weathering powders more than paint. The last structure was just completed. It's a Berkshire Valley 1940's era gas station. Normally, I wouldn't have started another model with the layout under constructioin, but my 8-year old grandson who needed something to do when we were in the workshop. I thought the kit would be a breeze having only a few parts. But it was not to be. If you haven't built a BV resin kit, they need a lot of filing and fitting. I had to scratch build window frames when the warped resin ones fell apart when I tried to sand them to fit. 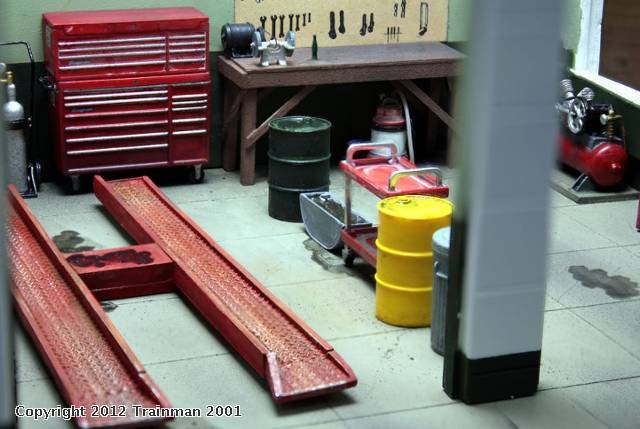 I also did the full monty of interior treatments having purchased the BV accessories kit and a model car "Snap-on Tools Garage Set". I added a Miller Engineering florescent tube, and modified the white metal lamppost with an aluminum tube and mounted a grain of rice bulb so it will now illuminate the exterior. 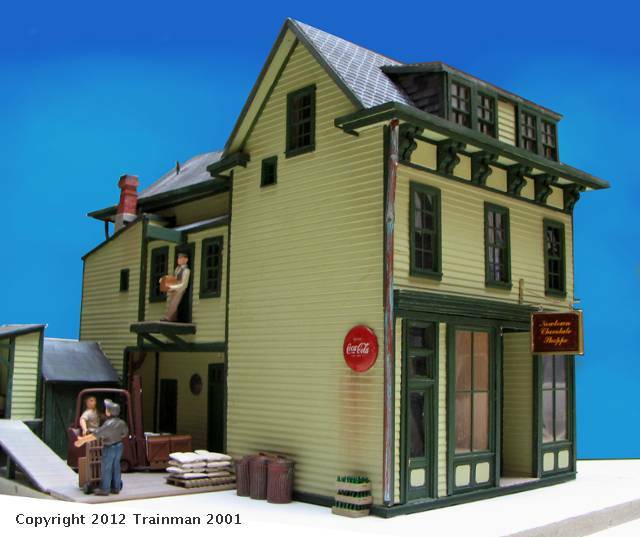 Still on the "to be built" shelf is another Bar Mills kit, the Gravely Hotel; the beautiful "Parkside Diner" from Miller Engineering; and the great fire house in resin from Westport Models. Miller, at the York show told me that the diner kit is now worth about 3X what I paid for it unbuilt. That would pay for the DCS system, but my wife says "don't sell it so fast". 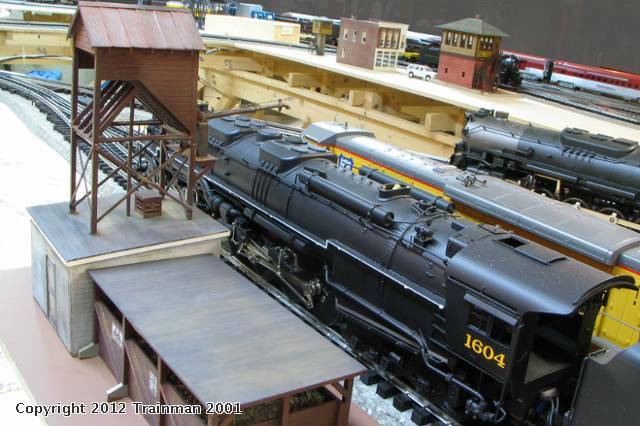 I have several buildings that I bought built when a person from my own homestead broke up and sold a massive O'scale empire that was in one of Kalmbach's "Great Model RR" books. 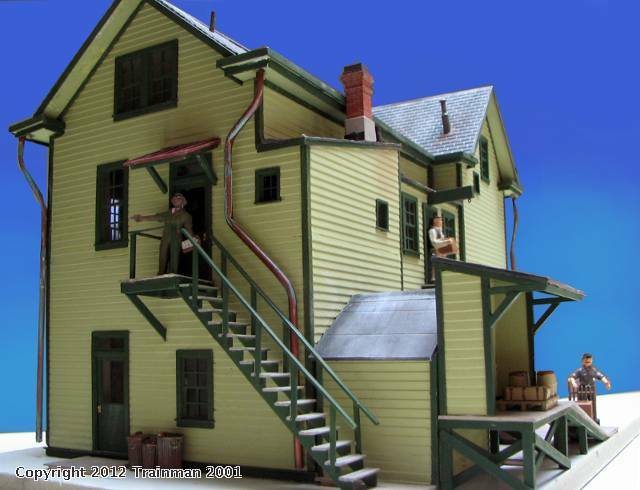 I have a beautiful timber 40,000 gallon water tower, a watchman's tower, and one of DCM corner stores. The store has no interior. I'm going to build one, and I bought a Miller EL "Zenith Appliances" signs are York last month. Still needed for the engine service area is an engine house. I like the BV concrete diesel houses. I don't have the $$$ for a roundhouse and turntable, although I could make room for it.